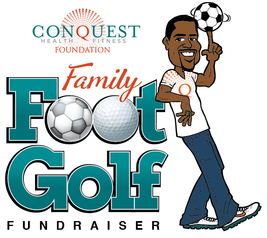 Conquest Health and Fitness Foundation will host its 2nd Annual Andre Hutson Family FootGolf Fundraiser. This event gets families and friends outside to enjoy the unique game of FootGolf, be active, and join in supporting our fight against childhood obesity. Other family activities include an inflatable fitness course, face painting, and a photo booth. Participants will also enjoy music, prizes and lunch to round out a great event. Individuals are encouraged to bring their own soccer ball (regulation #5) to use for the event. Def.-FootGolf is using your feet to strike a soccer ball down the fairway and toward a specially designed oversized cup. The lowest number of total shots determines the winner. FootGolf is for people of all ages and fitness levels, males and females, young and old. team registration - Two easy ways! Register online and skip the paperwork. Registration is not confirmed until payment is received. Be sure to indicate the school and team you would like to support if applicable. Teams of four are required. If you are looking for others to play with please contact Russ Cunningham . You will be added to our list for others to play with. Click here to access a pdf version you can fill out, print and mail back with your payment. Please let us know how many soccer balls you will bring. Please make checks out to: Conquest Health and Fitness Foundation. Credit cards are not accepted for payment. Invoice available upon request. We live in Michigan and Mother Nature does not always cooperate. If for some reason the event is cancelled it will not be rescheduled. Conquest Health and Fitness Foundation will mail 4 FootGolf vouchers to the team captain. Each voucher can be redeemed for one game of FootGolf. The entry fee will be treated as a donation to the foundation.